How to buy the best water tank heater for your home? Explore the advantages, disadvantages and find the most popular sizes and manufacturers of the hot water tanks. Tank water heaters are also known as storage tank type or cylinders. Gas water heaters with the storage tank are the most popular type for water heating in North America where 50-gallon capacity is the most used size. 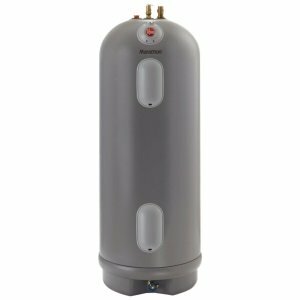 With the available capacities from 20 gallons to over 100 gallons, water heater tanks are designed as the whole-house systems so they can supply more than one fixture at a time. Water storage tank heater is recommended for homes with the steady demands. Tank water heaters are using gas, electricity and solar energy for heating. As opposed to tankless heaters, the storage-tank type is built very simply where the tank occupies most of the unit. Every unit, made of the metal, has the anode rod, thermostat, dip tube, TPR valve and drain valve. Gas-powered water tank heaters have also the gas valve, burner assembly, gas combustion chamber and the flue baffle (vent). Almost all new gas water heaters are equipped with the FVIR system that is designed to protect from the accidental fire of the flammable vapors. From the gas burner, through the tank and water stored inside, there is a flue tube that extracts the gases out, either naturally (atmospheric vent units) or forced (power vent units). Most of the gas water heaters are using the pilot light for lighting the main burner, while other more advanced are using the hot surface, for example. Electric water tank heaters are the simplest units, that utilize the upper and lower heating element for heating the water. Solar water tank heaters are actually storage tanks that store heated water (from solar panels) with an addition of the heating elements, for the backup heating. The storage tank of the heater is the place where the cold water enters for heating and where hot water is stored for use. Incoming cold water is coming from the home plumbing through the inlet tube or dip tube to the lower part of the tank. Water is heated either by the heating elements (electric type) or gas burner (gas type) and as it is becoming hot, it rises up from where it is going to through the plumbing to the hot water tap (once it is open). Every gallon of hot water that exits the water tank heater is then being replaced by the cold water again through the dip tube. The thermostat, which measures the temperature of the water inside the tank, is what signals the heater to start heating by charging the heating element(s). How many applications (shower, dishwasher...) will be using hot water? The usage pattern of your family members: frequent short or high-flow and high volume draws. For the shower you need at least 20 gallons of hot water, for shaving - 2 gallons, hands and face washing - 4 gallons, food preparation - 5 gallons, automatic dishwasher – 14 gallons and so on. So, if you have calculated that you need 50 gallons of hot water you would buy a 70-gallon water heater (70% is the available volume). Buy the energy efficient water tank heater or Energy Star approved. The EF (energy factor) has to be 0.67 or higher. EF is what indicates how efficiently the heat is transferred to the water. Condensing units have the highest EF which can be more than 0.9. High-efficiency water heaters are usually equipped with the heat traps and have thicker insulation and R-value. For the heaters with the lower efficiency, it is recommended to use an insulation blanket. Buy a heater with the larger rod or more than one anode rods as such units have a better warranty and are protected from corrosion longer. Powered anodes are even better, as they are not sacrificial. For the family of four to five, 50-gallon tank size is sufficient. Use the following instructions for sizing a water heater. If it is needed, look for the high First Hour Delivery and recovery rate, and low standby heat loss. Gas heaters are a good buy as they have higher First Hour Rating than the electrical ones so you might need a smaller unit for your water heating needs than the electric. Look for the tank-type heater with the self cleaning system as it automatically fights the sediment build-up problem; also green or low NOx burner, high recovery, high performance or high efficient models. The First Hour Delivery and other info can be found on the Energy-Guide label. The tank-type heater has to deal with the standby heat loss as the water is heated when not in use and as it is losing the energy through the outer surface. A gas tank-type heater provides hot water even during the power outages. No electricity required. They are free-standing, therefore, occupying a valuable floor space. The dedicated room is needed for the gas type. You cannot go wrong if you buy a tank-type water heater. They are affordable, utilize the proven and safe technology, and can save a lot if you chose condensing or high efficient model. If you have to decide between electric and gas, go with the natural gas model. It is cheaper to use in the long run and it heats water fast. Energy Star models are available from all manufacturers. How to flush hot water heater. Step by step instructions. Step by step guide how to drain the heater. Hot WH maintenance and care for the efficient water heating. Find out which elements have to be maintain and how often. How to remove the old WH; step by step guide. No need to call a plumber! Removing the old unit is DIY home project and is not hard.